Guys, I actually pre-ordered this last year and then took 11 months to pick it up. Last week I heard Tahereh Mafi was coming to Holland soon and I felt the need to prepare to fangirl because seriously, how many chances do I get for that around here? And holy smokes, WHY DID I WAIT SO LONG??? I am so in love with this book, it's not even funny, I finished it at 2AM and wanted to tell the whole world (a sleepy, grumbly world) how much awesome was in these pages! I had to get used to the writing a bit at first, because it's different. But different in a beautiful, amazingly GOOD way! There was so much beauty in the prose alone that even if the plot hadn't been making me excited, I would have still kept reading for the mindblowing way Tahereh Mafi has with words. I wanted to slow down and revel in every sentence and at the same time I couldn't stop myself from speeding on because I NEEDED to know what would happen next RIGHT AWAY! And I haven't even told you about my love for the characters! Juliette is sheer awesomeness. She's beautiful and broken and just has such a sense of right and wrong and is trying to cling to her sanity when she's been locked up for 264 days. My heart broke for her and soared with hope right along with her. She's fragile and strong at the same time and her personality just sucked me in and made me want to give her a hug. I can't imagine going without really touching another person all your life, it's horrifying to imagine! I have been hearing about the love 'triangle', but for me there never really was a triangle in this story, because seriously Adam has no competition. He is such a GOOD guy, and you guys know about my weakness for good guys, I loved the history he and Juliette share and with every revelation I loved him more. And all you people putting up Warner as a possible third in the love 'triangle', NO. Just, no. He's such a psychopath, I get that there's a reason for him being this messed up version of a human being, but I can't see him as a potential love interest. Not even if Adam wasn't in the picture. 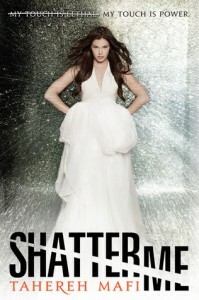 Shatter Me was such an intense read that I just had to come up for air a couple of times! But I felt compelled to pick it up right away, so these breaks weren't that long. It's not often that I'm this blown away by the beauty of the phrases as well as the impact of the story! Shatter Me had me feeling ALL THE THINGS and I cannot wait for Unravel Me to be released!